I keep a spreadsheet of what animals I see each month not only in the parks I visit but in places I’ve lived. During our 16 years in the urban neighborhood of our Portland house I recorded 10 bird species for the month of March. In a few days at our new house in Scottsdale I’ve seen 13! Including this lovely male cardinal who sang to me on the day the mover’s arrived with our belongings. He serenaded Ellie and I this morning as we relaxed on the back porch. Verdin were building a nest in the buckhorn cholla in the common area below the house. Lesser goldfinches flitted about, curve-billed thrashers called out. A pair of Gambel’s quail fed near the house as Sam and Trixie watched eagerly from the windows. Phainopepla, mourning doves, house finches, house sparrows, gila woodpeckers, a pair of Harris’s hawks soaring overhead. I stood dumbfounded watching a robin, a bird I’ve known from everywhere I’ve lived but had no idea lived in Arizona. Yesterday on my first commute home from a work a roadrunner darted across the road (with no coyote in hot pursuit). 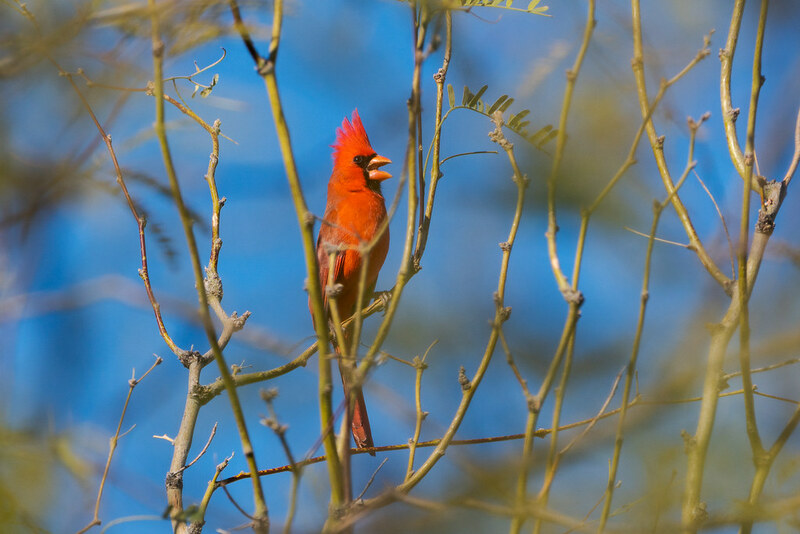 This entry was posted in Birds and tagged Arizona, backyard, northern cardinal, perching, Scottsdale, tree. Bookmark the permalink.